A company without CRM is like fish out of water – continuous growing competition, high customer attrition rate and frequent change in customers’ buying trends are most common challenges for an organization to sustain and grow further. CRM is the only solution for an organization to nurture existing contacts properly and capture new customers. But it is really tough for a small or medium organization to spend a good amount to setup CRM application. Best solution is, choose free open source CRM to solve these business challenges. But there are lots of free open source CRM software with rich functionalities and number of such free CRM applications is continuously growing which is bit confusing for an organization to choose the right CRM for business. You could read our article on how to choose the best CRM for your organization. Here we will discuss best 5 cloud based free CRM applications which could be life saver for a small or medium organization. There are many open source CRM applications available in the market but not all of them are cloud based free CRM, for example Vtiger is free when it is installed locally but cloud version is paid. But we know, time and infrastructure, both matter for an organization, especially if it is SME. In case of cloud based CRM software, an enterprise does not need to spend any money for infrastructure, also application customization is real quick and easy task. There are many other benefits for cloud based CRM over on premise CRM but these are the main two reasons for which we suggest a SME to go for cloud based free CRM software. Zoho is well-known CRM application with great features. It has web apps for almost everything that a SME needs like CRM, email integration, file sharing, social networking. It’s free edition allows an organization to create 10 free accounts with 1 GB space and limited functionalities but all these are sufficient for a small or medium company to generate leads, manage contacts and increase revenue. There are many other cloud based free CRM applications as well like Podio, Clevertim, Raynet, Highrise, FreeCRM. But free edition of these CRM applications have more limited features like Podio does not include user management facility, Clevertim has no file storage and FreeCRM is free for 1 year only. CRM market is ever changing and highly competitive place, so it is really tough to tell which one is best cloud based FREE CRM. But we can easily decide best CRM application for an organization. Though we have listed down 5 cloud based free CRM applications here, we highly recommend an organization to try Bitrix24 and Zoho CRM. If you want to know which FREE CRM suites for your business most, please contact us to get free quote. Did we miss to mention any other great free CRM application here? Please write it below. Recently one of our readers has received an email from Google AdSense Publishers with subject line ‘Policy Breach Notice‘. As email didn’t give him enough information to clear his doubt, he dropped us email asking more information. He also mentioned that he didn’t receive any prior email regarding policy breach violation. After our small research, we got to know that this problem is not with our particular reader only. Many of our readers have received the same email. What is PII and how it is related to Policy Breach Notice? PII stands for Personally Identifiable Information. To protect your account, Google AdSense policies mandate publishers not to pass any data to Google that may be recognized as Personally Identifiable Information. If any publisher does so, Google sends a notification email with subject line ‘Policy Breach Notice’ first to fix the issue. Once the affected publisher fixes the PII issue, Google sends the above email. As you didn’t not receive any prior email to fix the PII issue, we think Google AdSense has sent this email by mistake. However we have asked the question to Google also to give more information. If we receive any update, we will share it with you all. So don’t worry and keep blogging ! *** Updated on 6th March, 2015: We told you that the mail must be sent out by mistake. Today we have received an email from Google asking for an apology for sending erroneous email. Probably you have also received the same email. If you have any question about ‘Policy Breach Notice‘, Please feel free to comment below. Also read: YouTube Linked Comment – why I can’t reply? First of all, thank you Rann for posting your doubt on our discussion forum. This is in fact a good question. OLX or Quikr does not charge anything from us for posting ads, then how they earn money? Well, though they do not charge anything from us, there are many other ways to earn revenue. OLX, Quikr or any other eCommerce sites get huge traffic flows every day and millions of unique visitors every month. So displaying AdSense ads on every page gives a decent amount of money. Beside AdSense ads, Quikr or OLX sells its website space to various enterprises to display their ads or banners, just like AdSense ads. Difference from AdSense is that sponsored ads are completely controlled by these eCommerce sites, there is no revenue share with 3rd parties. If you want your products or services to make more visible or reach out more viewers to sell it faster, then premium ad is a good option. Quikr provides two type of premium ads – Top Of Page and Urgent. A ‘Top Of Page’ ad costs you more than ‘Urgent’ as Quikr shows this kind of ads at the top of each ad category highlighted in blue. It helps to get more visibility than Urgent ads. Urgent ads are indicated by a green star before ad title. To display premium ads, Quikr charges you depending upon product category, type of premium ads. These are the main three sources of making money for any eCommerce site. If you want to share anything on How does OLX or Quikr make money, please feel free to comment here. To know more, follow ‘TechOneStop‘ on Facebook / Twitter / LinkedIn or join our website as follower. What is ‘Where 1=1, 1=2’ in Oracle SQL? What is the purpose of using where 1=1 and 1=2 in Oracle SQL? Hi Michael, thank you for posting your question on our discussion forum. You could use any number like 2=3 or 3=3, only thing that matters here is both numbers are same or not. – This will create table_b same as table_a without copying records from table_a, only table description will be copied to table_b. – This will copy table structure, all records from table_a to table_b. Please let us know if it was helpful. If you want to add more information, please feel free to comment here. What is Caret Browsing ( or Caret Navigation) ? Have you heard about Caret Browsing? This is quite old technical term but if you are not keyboard savvy person, you would not be familiar with caret browsing or caret navigation. Like most of the people, you probably use mouse to select text on a webpage during internet browsing and just for typing purpose, you use keyboard. But what would you call it, if you can select text on a webpage by using keyboard only? This is what we call as called Caret Browsing or Caret Navigation where a caret (also known as ‘text cursor’ or ‘text insertion cursor’ or ‘text selection cursor) is used to navigate within webpage, same as Microsoft Word. But this feature is not supported by all browsers, Internet Explorer and Mozilla Firefox support Caret Browsing. To enable or disable Caret Browsing on a webpage, just press ‘F7’ function key. It will prompt you to turn Caret Browsing on, press ‘Yes’ and Caret Browsing will be enabled. Now you can use various navigation keys on your keyboard including ‘Home’, ‘End’, ‘Page Up’, ‘Page Down’, 4 arrow keys to select text, hold ‘Shift’ key and move the caret to select multiple lines. Almost it looks like a cellphone browser, quite useful when you are using laptop touchpad rather than a mouse. – To enable Caret Browsing for new window and tabs (only for Internet Explorer), click on ‘Tools’ (‘Gear’ icon on top right hand corner), go to Internet Options > Advanced and mark the check box ‘Enable Caret Browsing for new windows and tabs‘ true. To disable Caret Browsing, press F7 again. 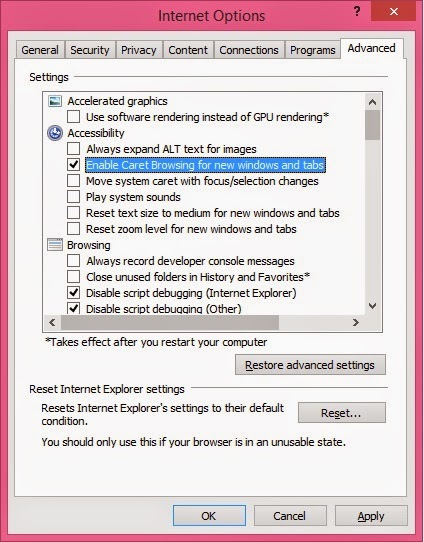 If the checkbox ‘Enable Caret Browsing for new windows and tabs‘ is marked, uncheck it. For more updates on recent activities, follow ‘TechOneStop‘ on Facebook / Twitter / LinkedIn or join our website as follower.